Chelsea star Eden Hazard was in fine form for his 100th appearance with the Belgian national team last night. As well as getting on the score sheet, the 28-year-old treated us all to this moment of fancy footwork, in which he terrorised three Cyprus players. 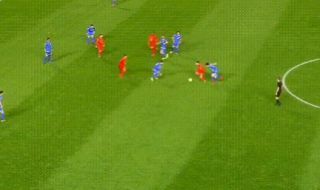 Watch the video above as Hazard uses his superbly quick feet to evade the challenges of three players in virtually no space in the middle of the field. Okay, it may only have been Cyprus he was up against, but we’ve seen him do this to big-name opponents too, and it’s just another example of what a joy to watch the Blues forward is when he’s in the mood.